Mission to Richmond - April 28-29 - Register today! 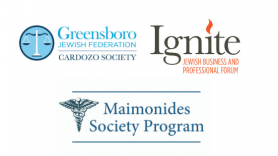 Joint Affinity Group program - Thursday, May 16, 5:30 p.m.
Federation has been supporting, sustaining and revitalizing Jewish life for nearly a century. Today our work is far from finished. And we need your support. Your contribution helps to care for our entire Jewish community. Enabling us to use your gift wherever it’s needed most, at home, in Israel and around the world. CLICK HERE to learn more about making donations. It's easy to explain what we do, how we do it, and why it's important! 1. E-News - receive emails 2x each month on the 2nd and 4th Wednesday. 2. E-News plus Life Cycle and Events - receive all emails, including life cycle, events and e-news. 3. Limited updates - includes events, special announcements and e-news (no life cycle). Sign up here - choose how many emails you receive. 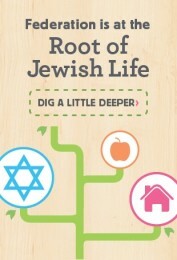 In 2019, the Greensboro Jewish Federation began publishing a new magazine. The magazine features updates on events and programs, stories focused on how you can be involved in the Greensboro Jewish community plus a feature article. We invite you to explore Shalom Greensboro. Advertising space is available - learn more here.